This colorful Acropora species is not fluorescent – the proteins it contains preferentially reflect red and blue light, making it appear purple. 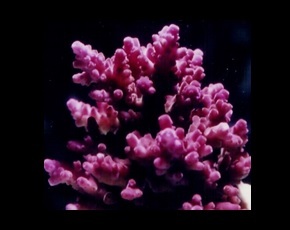 When I managed a commercial coral farm in the 1990’s, we were content just to grow corals and propagate them. Although we knew beautifully colored corals could bring a premium price, their availability on the east coast of the United States was limited. Today, that situation has changed drastically and corals possessing all the colors of a rainbow are common place. But maintaining that coloration in captivity is sometimes problematic. This short article will serve as an introduction to marine invertebrate coloration. This issue is complex, and we’ll begin with some basics. There are at least two types of color compounds seen in some corals and anemones – fluorescent and non-fluorescent. Fluorescence is when a compound absorbs light and emits (fluoresces) it at a longer wavelength, hence fluorescent compounds glow (or ‘pop’) under UV/violet/blue light, while the non-fluorescent types do not (they appear dull under those wavelengths and are called chromoproteins.). All are proteins and are manufactured by the coral or anemone. There are hundreds of proteins described but there are likely to be thousands. The structure of the protein is basically the same. See Figure 1. 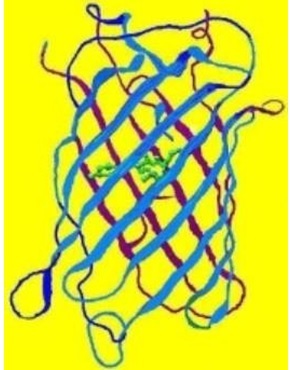 The portion of the protein that can become colorful (fluorescent or not) is wrapped inside bands (called staves) – the entire structure is called a beta-barrel. The colorful portion (called a chromophore if not fluorescent or fluorophore if fluorescent) inside the beta-barrel can twist when exposed to certain environmental factors, such as light, pH, metals, etc. This twisting can cause the color to be switched on or off. Figure 1. The structure of a potentially colorful protein. The green portion within the protective bands is the part that can fluorescence, reflect light, or not be colorful at all. Green is used for illustrative purposes only – it can be many colors. These proteins are systematically categorized in ‘clades’ (a clade is something that shares a common ancestor.). Currently, there are 6 clades called A, B, C1, C2, C3, and D (a non-fluorescent chromoprotein found in Echinopora forskalina does not fit into any clade, suggesting a seventh exists.). Why is this important? As identity between proteins increases, the more likely it is to similarly respond to environmental factors. Clade A is found only in anemones (although Majano anemones contain a Clade C2 protein.). Clade B has, among others, all the chromoproteins seen in Acropora species (the only other chromoprotein currently analyzed is found in Stylophora pistillata and is of Clade C2.). Fluorescent proteins found in the corallimorph Discosoma are of Clade B. Clade C (C1, C2 and C3) in addition to those previously mentioned, are found in stony corals and zoanthids (the only yellow fluorescent protein officially described is found in a zoanthid.). Clade D proteins are found in stony corals, soft corals, and another corallimorph genus (Ricordea.). These colorful proteins respond to light differently. Some are thought to protect the coral and its symbiotic zooxanthellae from excessive amounts of light, while others (found in deeper waters) are believed to fluoresce light wavelengths that can aid photosynthesis. The complexity of this subject quickly becomes apparent. Next time, we’ll look at those proteins that are known to respond to light intensity/spectrum.